Having completed capital increases of 8.3 billion euros, which more than covered the capital needs identified by the Bank of Greece (BoG) under the baseline scenario, the single most important risk for Greek banks remains the non-performing loans (NPLs). According to the International Monetary Fund, Greek banks’ NPLs, which are defined as the loans past due for more than 90 days, remain the Achilles heel of the local banking system. Setting aside the qualitative elements, it is interesting to focus on some discrepancies related to the NPL figures released by the BoG and the troika institutions so far in 2014. In its interim Monetary Policy report, the Bank of Greece revealed that the NPL ratio rose to 31.9 percent at the end of December 2013 from 24.5 percent at the end of 2012. The breakdown per sector showed consumer credit NPLs remain at the top with their ratio at 47.3 percent (from 38.8 percent in 2012), followed by corporate loan NPLs at 31.8 percent (from 23.4 percent) and housing loans at 26.1 percent (from 21.4 percent). In its fourth review report of Greece’s Economic Adjustment Program, the European Commission (EC) came up with a higher number of the total NPL ratio at 33.1 percent (from 25.5 percent in 2012). Since both figures are different by more than one percentage point (pp) compared to those reported by the BoG, we could conclude that the two institutions uses a slightly different methodology. Nevertheless, the NPL breakdown provided by the EC showed a significant discrepancy in the BoG numbers. According to the Commission, the consumer credit NPL ratio fell to 16 percent in 2013 (from 18 percent in 2012). The absolute figure is equal to just one third of that posted by the Bank of Greece, while the trend is also the opposite with EC showing a 2 pp drop within 2013. The BoG figure indicates a 8.5 pp increase. Similarly, housing loan NPL is seen by the EC at 24 percent, 1 pp lower than that in 2012. The BoG figure stands 2 pp higher and indicates a rise of 4.7 pp year on year. 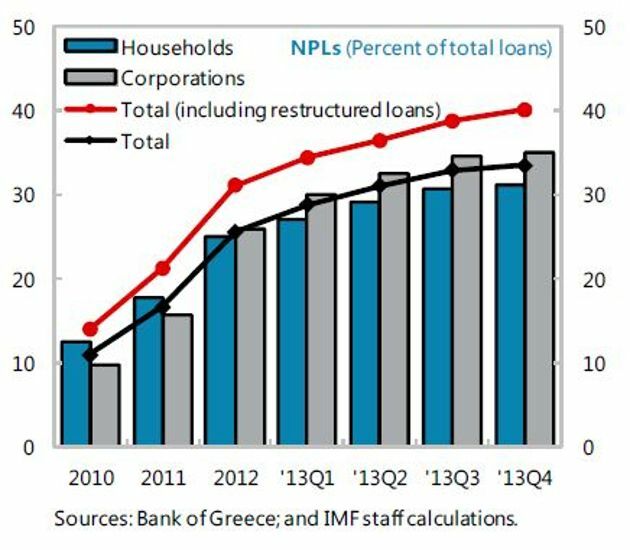 Compared to the Bank of Greece numbers, the lower NPL ratios for household lending provided by the Commission are compensated by a much higher figure for corporate lending, at 60 percent in 2013, implying a 3 pp rise on 2012 number. That is almost double compared to the central bank for 2013, while the rate of increase (3 pp) is much lower than the respective BoG figure of 8.4 pp. The IMF chose to point out in its fifth review report on Greece that NPLs and restructured loans - which according to Blackrock’s asset quality review have a high risk of renewed default – reached 40 percent of total loans by the end of 2013. Nevertheless, the BoG figure of 31.9 percent is depicted in one of the many busy tables of the report. The IMF also stressed that NPLs net of provisions exceeded the banks’ capital (138 percent) at the end of 2013, although this ratio has improved in 2014 due to the 8.3 billion equity raising. In addition, collateral values continue to fall apace, adding to the debt burden, according to the IMF. Calculating the NPL ratio for the top-4 banks using the figures provided by the banks in their 2013 results’ presentations, we get a NPL ratio at 32.6 percent for the Greek market and 30.4 percent at group level. In absolute figures, Greek NPLs amounted to 69.4 billion for the four systemic banks, which cumulatively control around 95 percent of the Greek market loans. Their group NPLs, including more than 10 billion of NPLs generated outside Greece from their foreign subsidiaries in the Southeastern Europe, stood at 79.7 billion at the end of 2013. More than one third of top-4 banks’ Greek NPLs are held by Piraeus, which has also the largest market in loans at 32.4 percent. 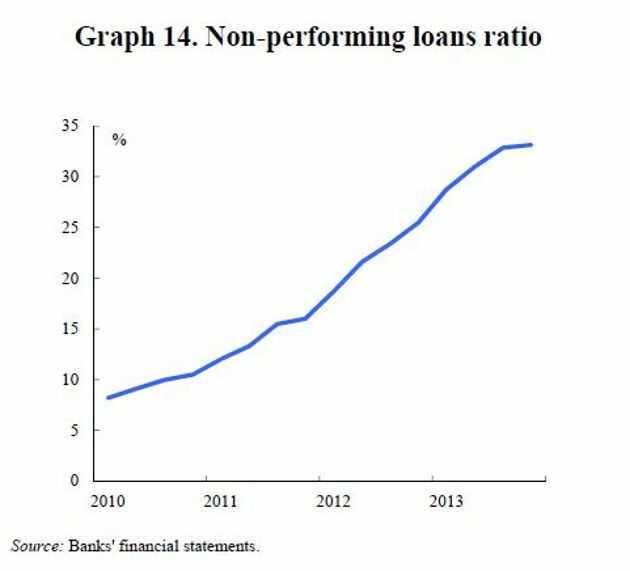 In contrast, National’s share of NPLs stands at 18.4 percent, 3 pp lower than its respective loan market share. This is explained by the bank’s limited M&A activity in the Greek market, while the other banks have been negatively affected by the legacy NPLs of the acquired banks. 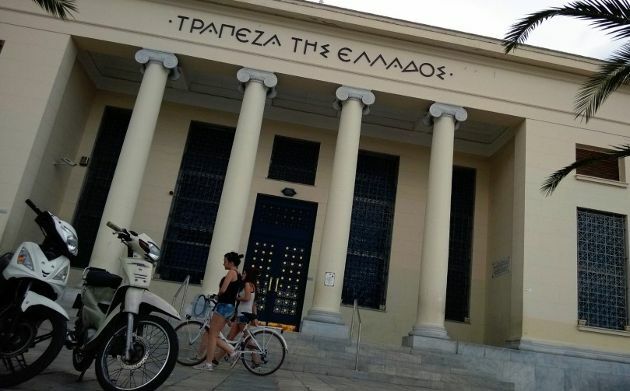 In his first speech in the Greek Parliament on June 25, the new central bank governor Yannis Stournaras noted that the NPL ratio in the first quarter of 2014 settled at 33.5 percent from 31.9 percent at the end of 2013. In absolute figures, this would correspond to NPLs of 72.3 billion euros over the outstanding loans balances of 215.9 billion at the end of March. During the same speech, the BoG governor also disclosed the NPL figures in absolute numbers for the first time, which stood at 77 billion euros in Q1 2014. More than half (42 billion) relate to corporate loan NPLs, followed by housing NPLs at 25 billion and consumer NPLs at 10 billion. If we compare the calculated 72.3 billion NPLs and the disclosed total NPL figure of 77 billion, we get a difference of around 5 billion. This is explained by a wider loan base (230 billion) used by the BoG. This refers to banks’ solo accounts (parent level) which also include government loans as well as loans that are granted outside Greece from Greek banks’ branches (not subsidiaries). Thus, the 77 billion NPLs mentioned by the BoG governor do not only include the credit risk of Greek private sector loans. Although not equally important to the different NPL ratios provided by the official sector, this is another discrepancy - this time related to the absolute numbers - that could confuse the financial community. According to the latest EC and IMF review reports, the Bank of Greece has committed to introducing key performance indicators (KPIs) to monitor banks’ progress in reducing their large NPL portfolios. In addition, banks will begin gradual reporting under these KPIs by June 2014 with full reporting to commence from the end of 2014. The relevant legislation was published in the Government Gazette at the end of May. Furthermore, a government council for the management of private debt has been established to coordinate legal and institutional reforms and enhance corporate and personal debt resolution frameworks. Local media indicate that initiatives regarding restructuring of corporate sectors with high NPLs are being considered by Bank of Greece and banking officials. In this respect, the former and the current BoG governors stressed that banks should grant loans to dynamic, export-oriented and viable enterprises with growth opportunities. The management of NPLs is one of the top issues on the agenda for talks between the troika technical delegation and the Greek authorities this week..